Palou Phelps Park is a rare native wildflower grassland, an endangered ecosystem in the US. Today one third of the park is under threat of building development. However, Nature in the City (NTC) and Friends of Palou Phelps, an advocacy group, are working with City agencies to improve public access and save the park. We are encouraged! Recently, NTC won a 2017 Community Challenge Grant of $100,000! With this grant we can steward walkable trails, new plants and much more in the works! Nature in the City won a 2017 Community Challenge Grant of $100,000. With the grant we are working to create walkable trails, plant new vegetation, and build community through stewardship. Preserving open spaces like Palou Phelps Park, in San Francisco's Bayview Hunter's Point for many future generations to enjoy. We're organizing with Friends of Palou Phelps to save the rare prairie grassland open space forever and eliminate the threat of development. We treasure this park as a place to seek beautiful views, adore nature, and spend time with our friends and family. What is the Palou Phelps Park and Community Garden? A rare native wildflower grassland and a community garden. The Park, on the Western side of Palou Avenue and on the Eastern side, the Community Garden, both now lush with native plants that attract pollinators. With the extraordinary spirit (and sweat) of local neighbor volunteers working with NTC, ongoing restoration of both of these sites has resulted in wildlife habitat, vegetables, fruit, and new neighbor friendships. This open space is owned by the city of San Francisco and managed by San Francisco Recreation and Parks Department and, under its auspices, managed by the Natural Areas Program. However, seven lots in this park are privately owned by three different landowners and developers..
Where is the Palou Phelps Park and Community Garden? Why is the Palou Phelps Park and Community Garden important? This wildflower grassland ecosystem is under threat of building development. To ensure the biodiversity of our region, it is crucial to preserve and restore this two and a half acre park. 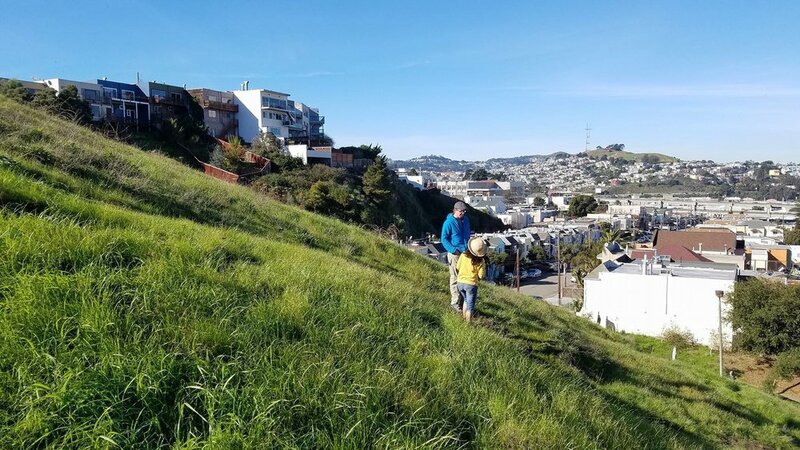 With its rolling grassland, native plants, and hilltop views of the city, this is a San Francisco treasure for native species—and for people. The park is a neighborhood gathering place with play areas for kids and is a hub for locals to enjoy movie nights and to make plans for advocacy next steps. The Garden is a delight for all who participate in its transformation. Today the garden has vegetable planters, fruit trees, and is an inviting spot for birds, bees, butterflies, and people to gather. What is our goal for the Palou Phelps Park and Community Garden project? In collaboration with Friends of Palou Phelps, we have identified five objectives for our environmental advocacy. Our environmental advocacy success is supported by your participation. Check out our MeetUp calendar to see dates for our ecological restoration work days. Volunteers are always welcome: join us just once or become a regular. We'll take you along our environmental advocacy process, connect you with energetic neighbors interested in preserving nature all while learning about nature, weeding, planting, or harvesting vegetables. A rare parcel of native land that we're actively working to conserve, Palou Phelps Park is located in the southeast corner of San Francisco.